We are represented by Ken Alpern (profile) who also serves on the WVHA's Board. Local engagement is important because no one understands a neighborhood better than the people who live, work and play there. The vision of a citywide system of independent and influential neighborhood councils, and the creation of a city department (the Department of Neighborhood Empowerment) to guide that process, was the centerpiece of the new City Charter that was approved by the voters in June 1999. There are currently 97 chartered Neighborhood Councils in Los Angeles. MVCC was certified in August, 2002. It is governed by an elected Board of Directors – the lowest rung of city government. Directors can serve up to four consecutive 2-year terms; MVCC's next election will be in 2019. Board members are not compensated for their work, but Neighborhood Councils receive public funds – in years past $37,000-$42,000 – to support their activities. This may include creating events and programs that respond to the unique needs of their community, providing neighborhood purpose grants to schools and non-profits, and advocating on behalf of the issues of concern to the community. Neighborhood Councils are subject to the Brown Act - California's Open Meetings law. They must post board and committee agendas at least 72-hours before a meeting and hold meetings in a location accessible to the public, including the handicapped. MVCC is NOT a Neighborhood Association. 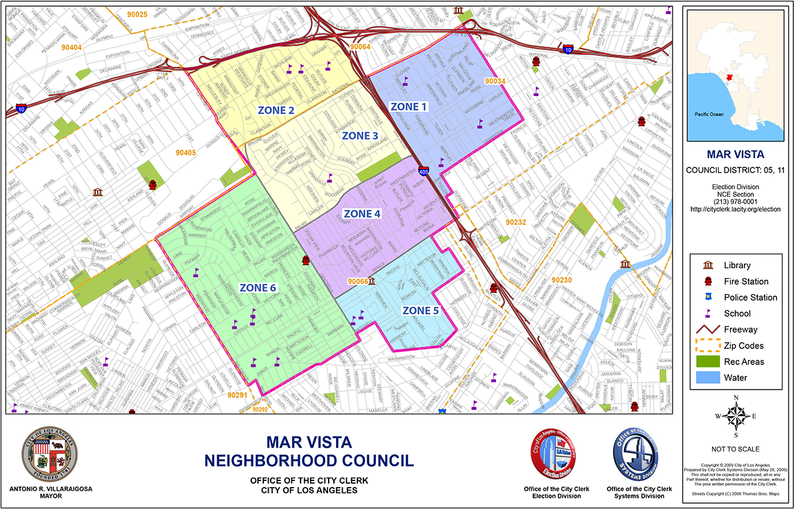 The area included within MVCC is home to eight Neighborhood Associations. These may or may-not be 501(c)3 not-for-profit organizations, are not city-certified, do not receive city funding, and are not subject to the Brown Act. Looking for a different park, visit www.laparks.org and you can search for all LA City Parks. Sign up to receive LAPD alerts and more through the www.Nixle.com service. This program encourages citizens to submit suspicious activity reports and has also been adopted nationwide. The goal of this program is to give citizens a way to help the various law enforcement agencies keep us safe.